Jump into Amazing Pyramids and lead a group of scientists through addicting word minigames and jumbled letters in the Saharan desert! Use your wits and vocabulary to keep you one step ahead, and to survive the blistering sun. Earn bonuses for quick and clever solutions and explore some Amazing Pyramids! Can you piece together an ancient mystery and save the day? Download free full version game today and solve intricate word puzzles to unravel the secrets of an ancient city. 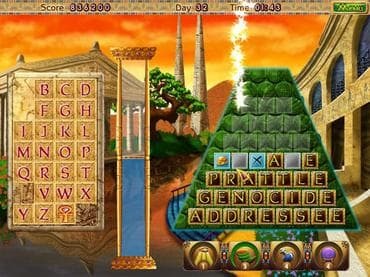 Free Game Features: - Adventure and Classic game modes; - Unique dictionary containing over 18,000 words; - Original Egyptian music and thematic sound effects; - Ancient storyline on 4 exotic locations; - Exciting mini-games; - 16 intriguing thematic levels. If you have questions about Amazing Pyramids game, please contact us using this form.